We have worked with our friend Yevnig of Unique Cakes by Yevnig on several wonderful occasions. We are continually impressed by Yevnig’s professional and inspiring approach to her work, so much so that we wished to introduce her in our ‘Spotlight’ series and allow you to ‘Meet the Maker’ behind some of the best cakes in our business. We most recently worked with Yvenig on Kate and Jamie’s wedding at the phenomenal Clivenden House. 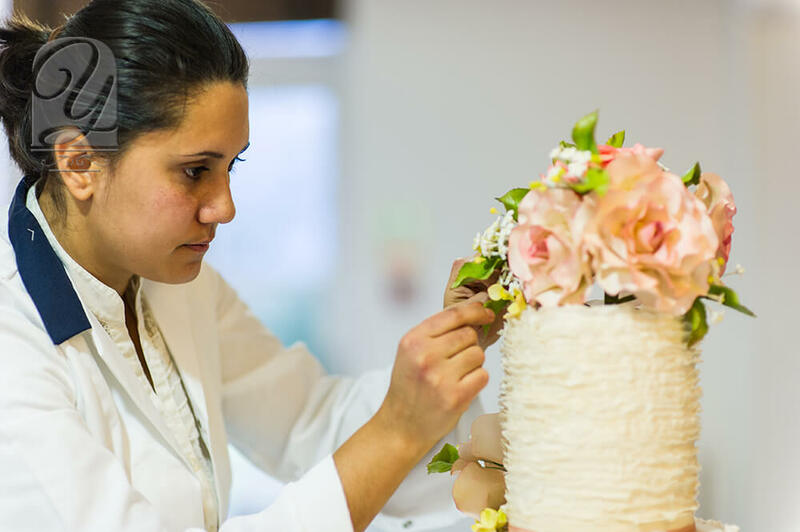 Prior to that, we worked on our clients Four Seasons Hampshire wedding to collaborate on the ‘Floral Charm’ cake with Paula Rooney Floral Design flowers. Yevnig’s attention to detail and pride in her work is what catapults her cakes to exciting heights. Not only does she bring complete professionalism to the industry but adds a dollop of fun in for good measure. We could not recommend Unique Cakes by Yevnig enough; all of her creations have been breathtaking and complementary to our clients floral vision. Working with Yevnig is a breath of fresh air! Can you give us a brief rundown of your working background to this point? I have worked in HR, Order Management and at a TV Station prior to running my cake company. Describe your approach to work in 3 words? What are the key services you offer your bridal parties when engaging with them? Luxury Centrepiece Wedding Cakes designed exclusively for the couple, along with Opulent Dessert Tables and Exquisite Wedding Favours. Do you follow the same design process with every cake you create? Everything we do is custom and tailored to the couple. We’re flexible and adaptable, which helps when working with exciting projects that don’t follow the norm! What has been your largest wedding to date? How did you manage any difficulties while planning? Biggest achievements? Our recent “The Cliveden” Wedding Cake comes close! A five tier striking cake of stature, lavished with real gold leaf and drawing inspiration from the glorious location of Cliveden House. Happy to say there were no real difficulties during the project, other than safety transporting such a large cake without shaking and movement. To ensure the smoothest of deliveries, the cake and I arrived style in a chauffeur driven performance Tesla! Can’t promise to ride like that every time to our deliveries, but it’s certainly an eye-opener to see the exciting future of Electric Vehicles. We all arrived unruffled! My biggest achievement is on-going; it’s when my couples (or their guests) see my work for the first time. There’s nothing more important and rewarding than to experience those “wow” moments! I’d hope my relaxed attitude and genuine love of weddings help. I have my clients best interests at heart and am honoured to be part of their big day. It’s a responsibility I take very seriously. How has your company grown since its origin? What’s on the cards for Unique Cakes by Yevnig in 2018? Lots! We are currently working on a number of very exciting projects which we hope to share more publicly soon. And of course, we have some amazing cakes to create for our couples’ weddings in the next few months!